Any German can tell you that wurst and and cabbage go hand in hand. Any Spaniard will say the same of chorizo and beans. But it takes a special, international inclination to make the case for kielbasa with brussels sprouts, white beans and mustard. I’ll tell you that it works wonderfully! The saltiness of the pork combined with the bitter, gentle crunch of the brussels sprouts and mildness of the beans is well-balanced perfection. Plus, its cheap, easy and looks good on a plate! Peel the shallot and cut into quarters. Make a small pouch out of aluminum foil (2 layers thick) and place inside the shallot and garlic. Coat with olive oil and a generous pinch of salt. Seal the pouch tightly and place in the oven (I recommend the toaster oven) at 400°F for 30 minutes. Rinse and pick clean the brussels sprouts. Cut each sprout in half, discarding any wilted or fugly outer leaves. Steam (or boil, your choice) the brussels sprouts until tender when pierced with a fork. Set aside. Rinse and drain the beans. Honestly, 1 can is a little too bean-heavy. You may want to save about 1/3 of the beans for something else. I know, I’m telling you now after you’ve bought a whole can, as opposed to buying 2/3 of a can. Slice the kielbasa on a steep bias into 1/4” slices. Heat 1 tsp. of olive oil in a large, heavy bottomed non-nonstick skillet over medium high heat. Arrange the kielbasa slices and fry until crispy on each side, about 3 minutes per side. It’ll smell like bacon, confusing your dog. Set aside (the kielbasa, not your dog) on paper towels to drain. If your skillet is full of porky goodness, keep it there. Add a generous tablespoon of good olive oil and keep the heat at medium high. Unwrap the garlic and shallot and smash them using the flat side of your knife. They should be very soft. Add them to the skillet and cook for about 1 minute. Add the mustard and cream to the skillet and stir to combine. Reduce the heat to medium low and add the brussels sprouts and beans (as many as you want to use). Toss everything together to coat, then season to taste with a generous amount of salt and black pepper. 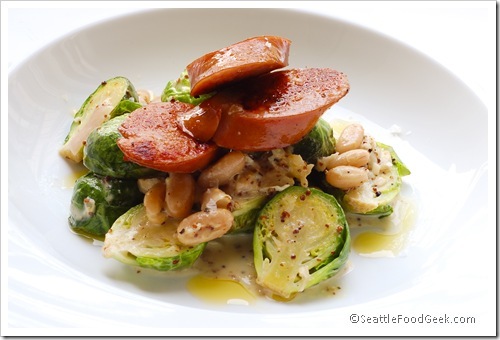 Plate the kielbasa on top of your brussels sprouts and beans in a large bowl to serve. If you’ve been hit hard by the recession, don’t worry – you can make this recipe without the brussels sprouts or the beans (choose one). There, I just saved you like $1.50. Maybe I should invite Suze Orman over for dinner! I totally made this and it was awesome. However, I used the homemade Andouille sausage from the Leschi Mart. It’s not like the traditional Andouile… has embedded peppercorns. I luved it. Thank you!